In this July 31, 2014 file photo, Supreme Court Justice Ruth Bader Ginsburg stands in her court chambers in Washington, D.C. 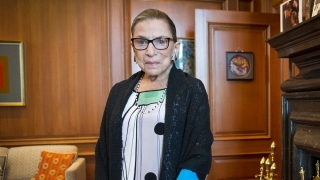 Fans of the Supreme Court and the opera are in for a double treat next month, when Justice Ruth Bader Ginsburg makes her debut in Washington, D.C., NBC News reports. She'll be on stage at the Washington National Opera as the Duchess of Krakenthorp in "The Daughter of the Regiment," though for one night only — opening night, on Nov. 12. The 83-year-old justice is a well-known opera fan, and has actually been on stage with the group before, as an extra in three productions, but this is her official debut. Ginsburg won't actually be singing in the 1840 rom-com by Gaetano Donizetti, though. Her part is strictly a speaking role.